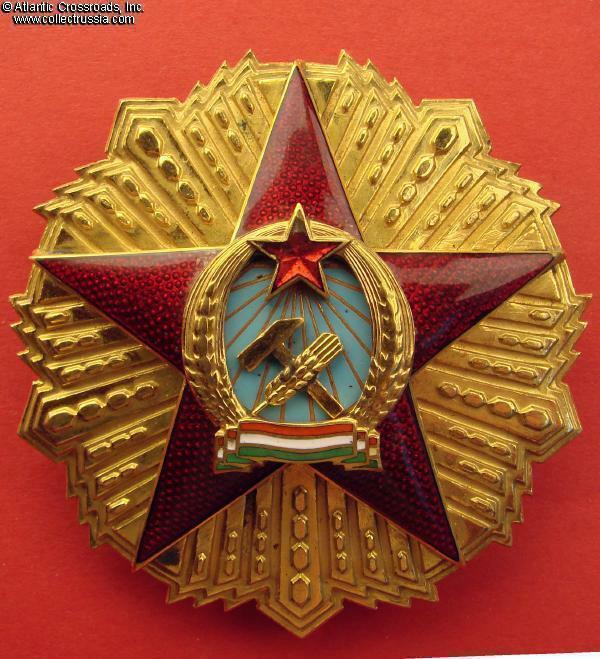 Order of Merit of the Hungarian People's Republic, 1st class Breast Star, 1949-1953. 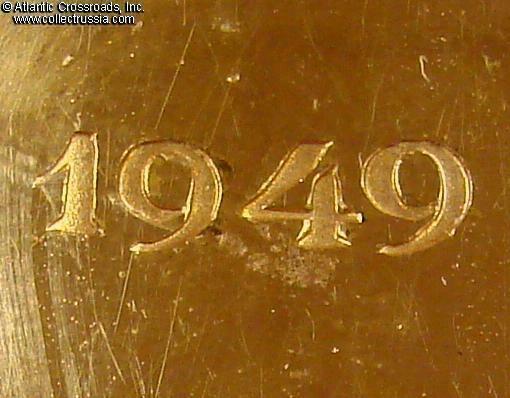 In gilded brass and enamels; measures 69.8 mm in heights, 69.8 mm in width; weighs 71.0 grams. 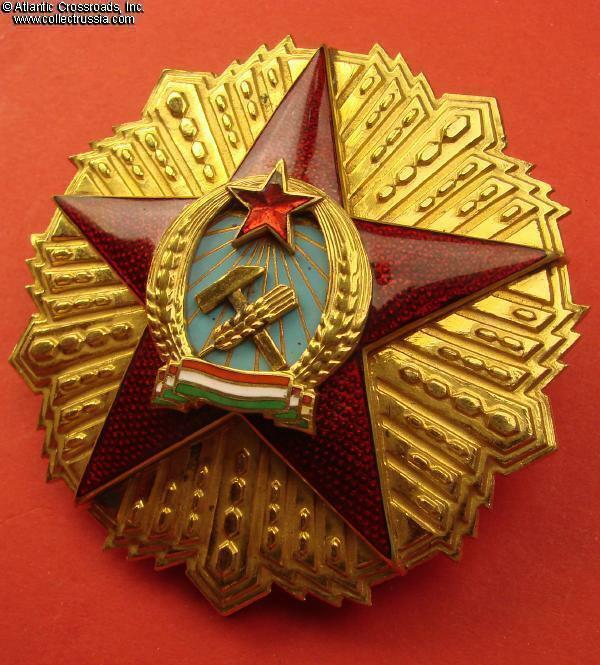 Multi-piece construction: the crossed hammer and ear of wheat, wreath with star and national flag, and the large red star are separate parts superimposed on the gold starburst. 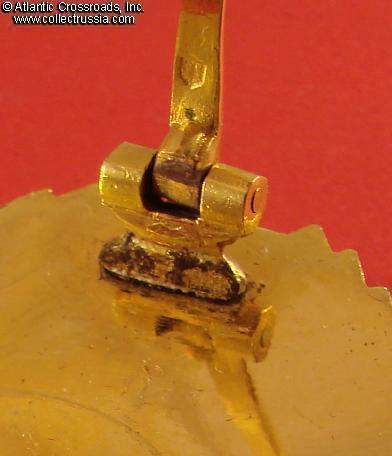 There is a standard five-sided maker mark to the underside of the pin near the hinge. 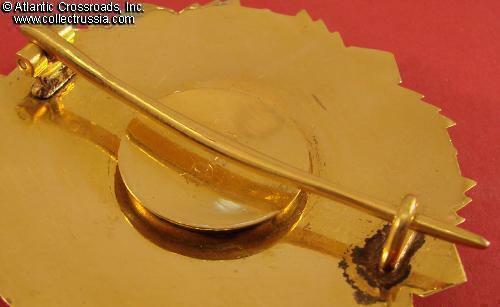 The quality is exceptional throughout. In very fine condition. 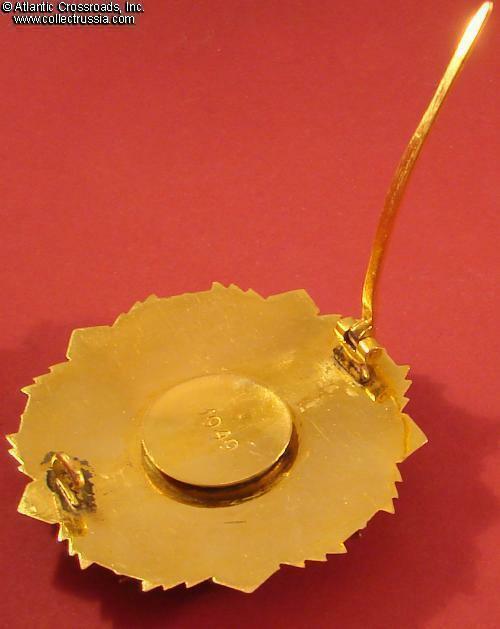 There is a chip to the small faceted red star, very insignificant given the overall scale of the award and not easily noticeable. 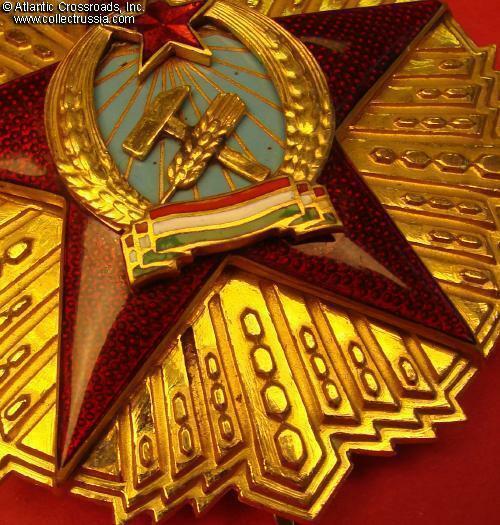 The red enamel on the large star as well as tri-colored national flag are perfect. 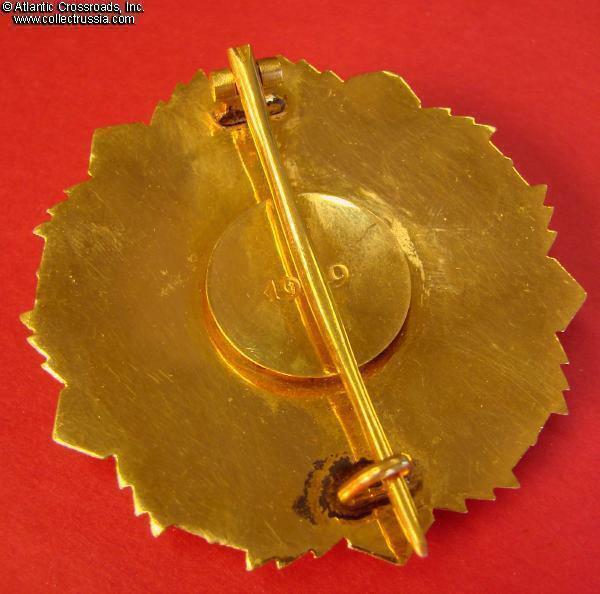 The are a few tiny "dots" to the azure enamel in the center medallion but these appear to be manufacturing imperfections rather than external damage, and are almost unnoticeable without magnification (they are visible only in our greatly enlarged photo). 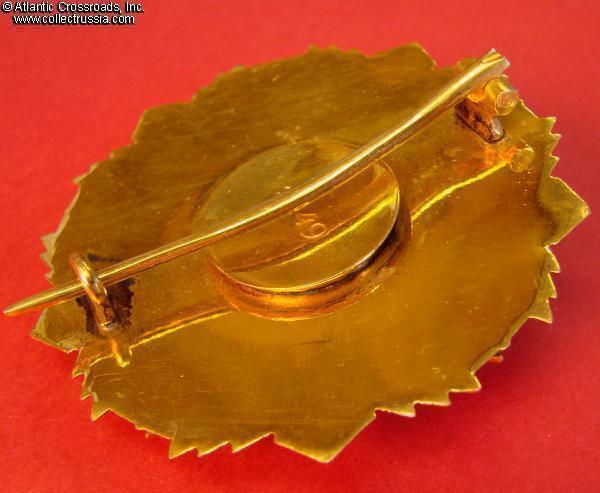 The gilt finish is exceptionally well preserved and bright on both the obverse and reverse. Founded 24 October 1949, the first presentation of the various degrees of the Hungarian Order of Merit appears to have been on May Day of 1950 - with a substantial number of awards going to Soviets. 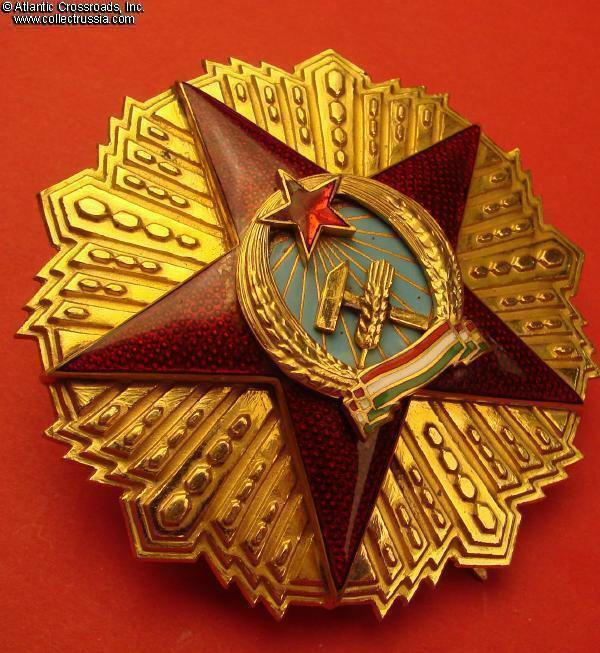 The various degrees of this Order were presented for less than three years before being replaced by a single medal (with a slightly simpler design) that eventually would display the last (1957) version of the communist national coat of arms in the center. 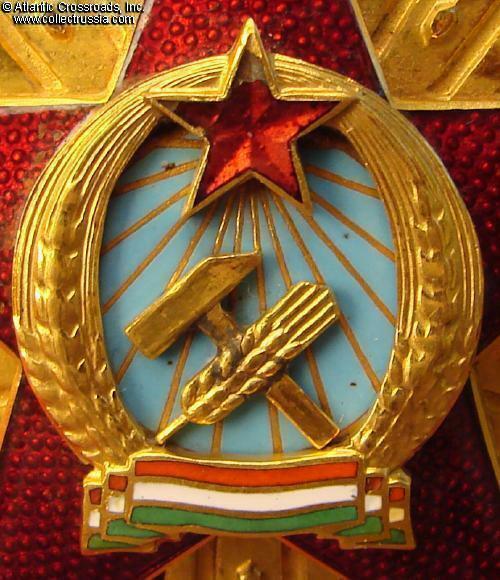 Only 169 of the first class were ever bestowed making this award one of the rarest of all decorations of the Communist Eastern Europe.